Finally-I got a Mojo Monday sketch done-just in time for the new one to be posted tomorrow! I like the way it came out too, after a little bit of a struggle on my part. Mainly because I haven't used my Circle Scissor much, and it's a challenge in a room as messy as mine! Once again I used some new things though-the Circle Scissor, Razzle Dazzle set & the Razzleberry Lemonade DSP. Card base is Melon Mambo-love that new color! Background layers are DSP from the Razzleberry Lemonade set. The Melon Mambo polka-dot ribbon is dots down across the layer. Scallop circle cut from Melon Mambo with the Big Shot. Main image on Whisper White, cut with the Circle Scissor. Razzle Dazzle image colored with Melon Mambo, Crushed Curry & Rich Razzleberry markers. 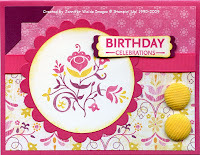 Saying from the Upsy Daisy set punched with the new Modern Label punch. Buttons are Summer Sun Corduroy. Corner punch is Rich Razzleberry. I sponged around the main image and saying with Crushed Curry. Break times over, back to work on something around the house, maybe dinner! I LOVE your card... Totally awesome that Razzleberry Lemonade DSP and the Razzle Dazzle set!! Glad you got to play today...I'm still TRYING to make it happen! Wow! That color combo just jumps off the screen! LOVE this card! I've been thinking about how handy a circle scissor would be... but haven't been that brave yet!